DMW Home Touches - Painter/Decorator based in Bognor Regis, West Sussex. Hello and welcome to our Checkatrade profile page. My name is Darren Whetton, owner of DMW Home Touches. (Sole Trader). 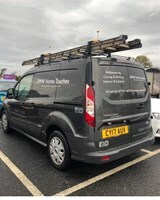 After studying Painting & Decorating at Chichester College for two years I had a vision to create a business working closely within the community offering high quality tradesman ship. Whether it be from a single door needing painted to a full house redecoration we will be humbled to help and get involved! We offer a friendly, reliable and competitive service with honest clean work to be proud. I cover all aspects of Painting & Decorating, which you will find under the 'Services' tab above. Please do not hesitate to get in touch for a free no obligation quotation or simply for advice or any ideas you have in mind! My promise to you is that I will treat your home as if it is my own; cleaning up thoroughly so there is nothing you have to do once I've left. Hamilton - Level 1 - Decorator of the Year 2013. For more information or to see our Facebook or Instagram pages then please clink the links! Arundel, Barnham, Bognor Regis, Chichester, Crowborough, Fontwell, Horsham, Littlehampton, Midhurst, Pulborough, Selsey, Shoreham, Worthing, Yapton.